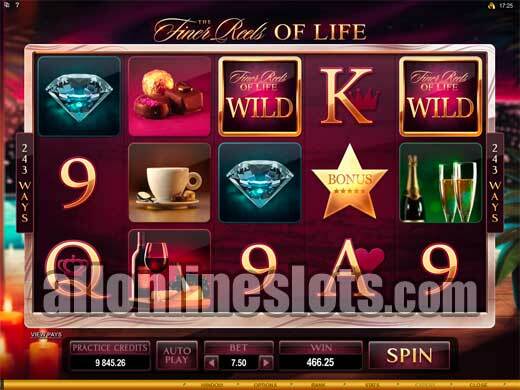 The Finer Reels of Life is a 243 ways video slot with four types of free spins and a wild reels feature where you can get a whole screen of wilds for a huge 1,800,000 coins. Max bet is 150 coins and coin sizes range from 0.01 to 0.05. 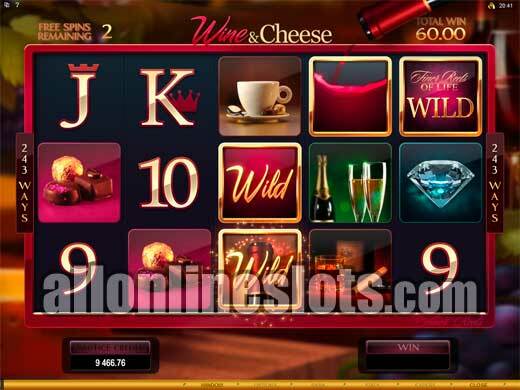 The Life of Luxury slot from WMS gaming has been popular with slot players ever since it was released and now Microgaming have gotten into the action with The Finer Reels of Life. 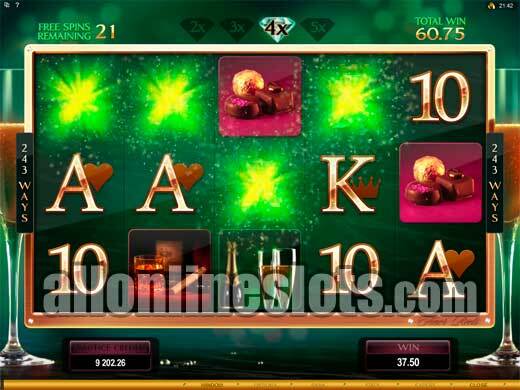 The game uses the 5 reel, 243 ways format and has a luxury theme with rich graphics, relaxing sounds and some serious jackpots. Like all 243 ways games you do not have to bet 243 coins to play all ways. Instead you have to bet 30 coins to cover all ways and can bet up to 5 coins per way. This gives you a minimum bet of just 0.30 at the lowest coin size and a maximum bet of 7.50 at the highest denomination. Of course there are lots of options in between these levels. On the base game the highest paying symbol is the Finer Reels of Life logo which pays 1,500 coins (7,500 coins at max bet) for five. Second and third highest way wins are 750 coins for five Diamonds and 500 coins for five Champagne symbols. From there the five of a kind way wins come in at between 400 and 30 coins. The first bonus on The Finer Reels of Life is the Wild Celebration. This bonus is triggered randomly and when awarded five Champagne bottles appear at the bottom of the screen. Watch for the popping corks as each one awards a wild reel (Preview). 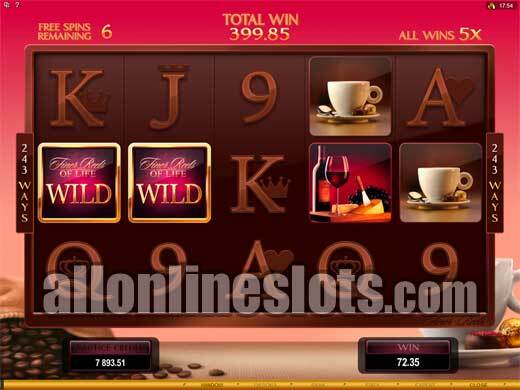 Get a full screen of wilds with max bet and you win the top * 1,800,000 coin jackpot. This bonus is essentially the same as the Wild Desire on Immortal Romance and the Wild Storm feature on Thunderstruck II. 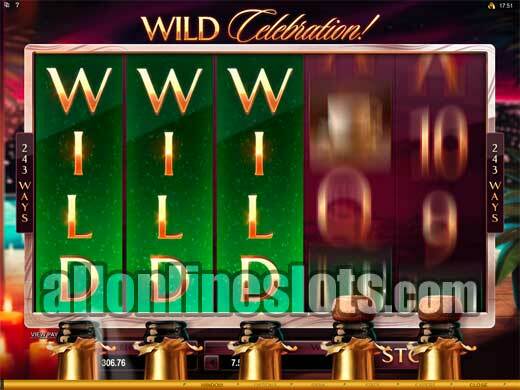 As well as the huge 1,800,000 coin with the Wild Celebration feature can still award some great wins with three or four wild reels. Of course it's also possible to win nothing which can be disappointing. 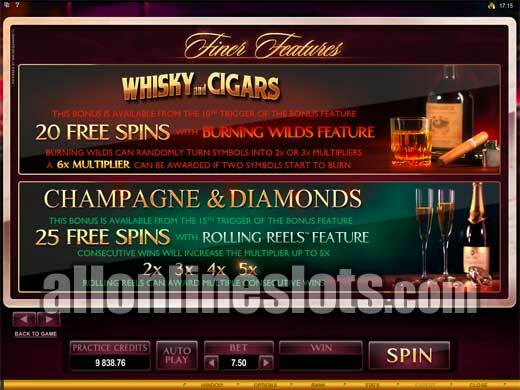 The Finer Reels of Life has four types of free spins. These are unlocked by hitting the bonus a set amount of times. Again this is identical to the way the free spins work on Immortal Romance and Thunderstruck 2. The bonus is triggered by getting three or more of the scattered star symbols. Hit five and you win a nice 7,500 coins or 37,500 at max. Win : 10 free spins with all wins X5 with re-triggers possible. 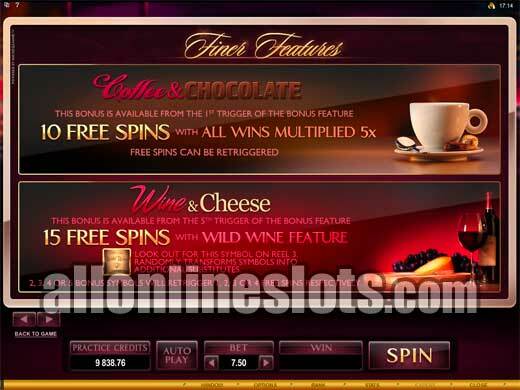 Win : 15 free spins with Wild Wine Feature. A Wild Wine symbol on the middle reel can add wild symbols to up to 15 other positions. 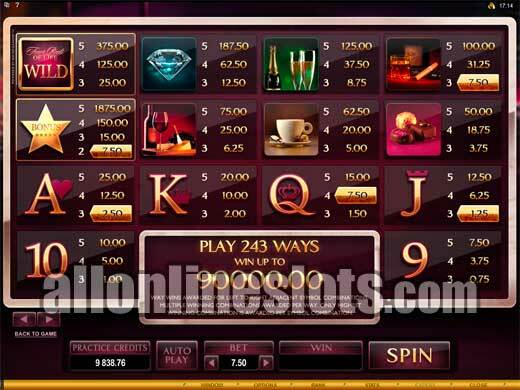 Get 2, 3, 4, or 5 scatters and you get 1, 2, 3 or 4 extra free spins. 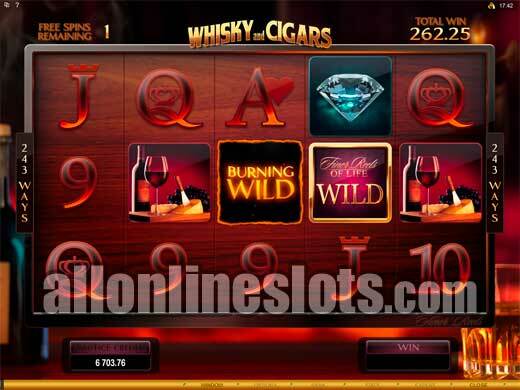 Win : 20 free spins with Burning Wilds. At the end of any winning spin a X2 or X3 wild multiplier is added to the screen. Get both and all wins are X6. Once you've unlocked the various bonus features they remain unlocked so from the 16th bonus trigger onwards you can choose whichever one you prefer. There is no real strategy as all of the features can pay well if you're lucky. The Wine and Cheese bonus is the only one where you can get a whole screen of wilds so if you want the biggest possible winning chances this is the one to go for. We tend to go for either this or the Coffee and Chocolate bonus as it can be re-triggered. In the end, The Finer Reels of Life does not really offer anything new in terms of game play. The game is very similar to Immortal Romance and Thunderstruck 2. Where it does stand out is with the theme. Microgaming have done a great job of creating a luxurious slot which will appeal to a wider audience compared to other similar games.